Brassinosteroids (BRs) are growth-promoting hormones that occur endogenously across the plant kingdom. Among plant hormones, BRs are structurally the most similar to animal steroid hormones, which have well-known functions in regulating embryonic and post-embryonic development and adult homeostasis, and like their animal counterparts, BRs regulate multiple physiological processes essential to both somatic and reproductive development. After their discovery in the 1970s, an array of experiments including bioassays, greenhouse and field trials, and physiological tests involving exogenous application of BRs, suggested these newly discovered plant compounds influenced organ elongation, leaf morphogenesis, senescence, male fertility, pollen development and fruit ripening. The biochemical delineation of the BR biosynthetic pathway and the discovery of BR deficient and insensitive mutants in Arabidopsis thaliana and several crop plants in the 1990s provided convincing evidence that BRs were as essential for normal plant development as the better-known plant hormones such as auxins, cytokinins and gibberellins. Numerous books and reviews covering currently known aspects of BR biology and chemistry are available, including biosynthesis and metabolism, physiological effects and signal transduction. A great deal of progress has been made recently in understanding specific components of BR signaling and in clarifying mechanisms by which BR perception ultimately results in regulation of large gene networks associated with numerous developmental programs. The number of physiological processes known to involve BR action has also expanded. In parallel with these advances in molecular biology and physiology, a large group of researchers have continued to demonstrate the utility of applying BRs to a broad spectrum of problems in agriculture, environmental science and even medicine. It is these practical applications of BRs that is the content of the current volume and this book occupies a unique niche in BR literature by focusing exclusively on practical topics. Given the large body of literature on application of BRs to agricultural crops and the demonstration that even minimal modulation of BR signaling or biosynthesis can have dramatic effects on rice yields and tomato fruit development, it is now evident that BRs will have practical applications in regulating the growth and development of many crop species. It is well known that BR field applications yield the most visible responses when crops are under stress, and three chapters in the current volume cover abiotic stresses such as drought, salinity and heavy metals; along with biotic stresses such as pathogen attack and plant defense responses. The role of plant hormones, including BRs, in regulating plant shoot growth is also well known and an additional chapter discusses novel uses of BRs in micropropagation. The final three chapters introduce the fascinating literature that shows the potential for BRs and their analogs in inhibiting human viral pathogen replication and the possible role of BRs and analogs as anti-inflammatory, anticancer and antiproliferative agents. The editor and authors of this volume should be commended for adding a unique contribution to BR literature that will be appreciated by those directly working on practical applications of BRs as well as molecular biologists studying BR mechanisms who wish to become familiar with the range of applications being considered for this family of plant steroids. Furthermore, medical researchers studying the role of phytochemicals in addressing treatment of human diseases will find the final three chapters of significant interest. Brassinosteroids (BRs) comprise a specific class of low-abundance, natural polyhydroxy steroidal lactones and ketones. These steroids of ubiquitous occurrence in plants are known for a long time to induce a broad variety of responses in plants such as cell expansion and division, shoot elongation, bending, resistance against biotic and abiotic stress, and reproductive and vascular development. However, more recently, these compounds have also been shown to present antiviral, anti-inflammatory and anticancer activity in animal systems. This e-Book provides and up-to-date view of practical applications for BRs. Each chapter presents a review of the available literature on various aspects of the use of BRs for the improvement of human welfare. The first chapter provides an overview about the increase in plant productivity and improvement of human health, besides addressing bio-safety issues. Second chapter describes the mitigation of water stress and saline stress. Third chapter uncovers the improvement of protocols for micropropagation. Fourth chapter will discuss anti-herbivory properties. Chapter five provide an insight into the enhancement of tolerance to heavy metals. 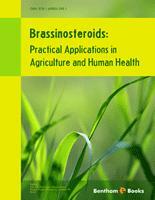 The following chapters will deal with the use of BRs for the improvement of human health. Chapter six will describe antiviral properties. Chapter seven summarizes antiherpetic and anti-inflammatory activities. Finally, Chapter eight will describe anticancer activities. The editor hopes that this e-Book will provide valuable and updated information on practical applications for BRs in agriculture and human health, besides leading to new research to expand the use of BRs for human welfare. The editor wish to thank all of the contributors for their willingness to provide the highest quality, state-of-the-art contributions to this e-Book.